This article covers how to add assignment groups and assignments to your course. As you add assignments, they will populate your gradebook. Read about grade weighting to determine whether or how you wish to use assignment groups to structure your assignments. If you're working with cross-listed courses, have a look at this article to see what you need to keep in mind when adding assignments. Give the group a name (“Quizzes”, “Tests,” “Labwork,” etc.). Enter the weight—this is a percentage of the final grade that assignments in this group will contribute to the final grade. So if quizzes are worth 25% of the final course grade, enter 25 here. When you start, the Other assignment group carries 100% of your grade weight. As you create your own assignment groups, that will be allocated to your groups. You can distribute the full 100% throughout your own assignment groups or leave a remainder in Other to cover miscellaneous assignments or grading factors. If you use all 100%, Other will disappear. The weight assigned to extra credit assignment groups (see below) is not counted towards the 100%. Check if every assignment in this group should be extra credit. If you wish to drop the lowest-graded assignments from a student's final grade calculation, enter the number of assignments to drop. So, if there are ten quizzes and you elect to drop two, the grade will be calculated from a student's eight highest-grades quizzes. Give the assignment a name and description. Enter a number of points—whatever number you like (no decimals, though!). Percentage grades will be calculated from how many points the student earns on an assignment; that percentage, in turn, is fed into the final grade calculation (for published assignments). Check if this is an extra credit assignment. For tests, you'll be asked to fill in the additional test fields, which are described here). Essay- and file-type assignments will present you with options for plagiarism-checking (if your school has enabled it). For discussions, choose whether to create a New discussion or select from any existing discussions. A new discussion will have the same name as the assignment; an existing discussion will change the name of the assignment. For peer-review files and essays, you'll be given a number of additional options, which are described here. You can select a global or course rubric for the following assignment types: grade-only, file, discussion, and essay. Check if the assignment is to be Published. Published assignments are used to calculate the final course grade and are visible to students (depending on the Availability setting). If not published, an assignment will be excluded from the final course grade and will not be visible to students. 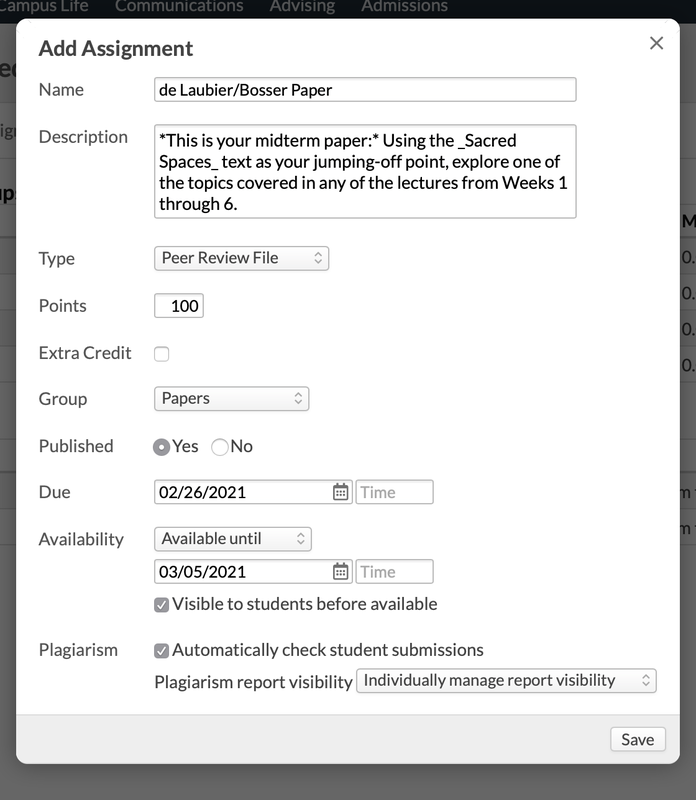 Unpublished assignments display in the main Assignments view with a Draft indicator. Select a rubric if the assignment type permits it. Select the Availability; this determines when students are able to submit work to the assignment. Available from lets you pick a date range. Available after/until asks you for a date to begin or end the availability period. You can add availability exceptions for individual students on the assignment page. Check Visible... to let students see the assignment before it's available. Uncheck if you wish to surprise them with it (great for pop quizzes!). It will show up in the assignments list arranged either alphabetically or by due date. It will show up in the gradebook in the same order as in the assignments list. As students submit work, you can start grading and interacting with them. You can edit individual assignments on their pages, or you can make changes to all of your assignments and groups at the same time—this helps you keep an eye on how a change made here affects an assignment there. Click Edit groups and assignments, which opens up all the fields for editing. You can change any field except for assignment type (you can change the type on an assignment on its page provided students haven't submitted any work to it yet). Click to delete an assignment. This also deletes any grades, files, tests, discussions, or student submissions for this assignment! If you delete an assignment group, the group's assignments will be transferred to Other.